Cooked chicken breast pieces in a tomato curry sauce with diced peppers and whole spices served with pilau rice. 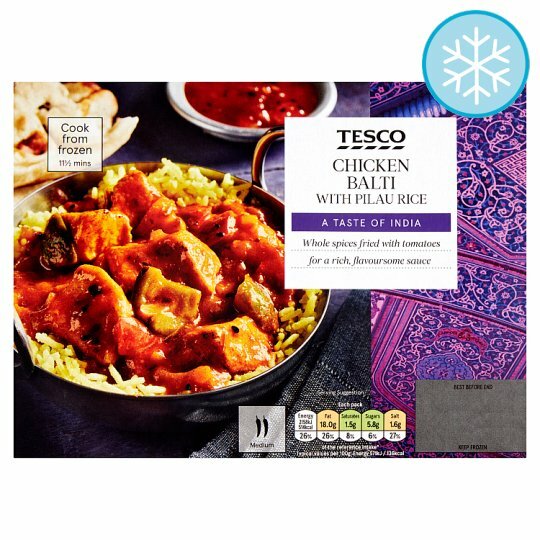 INGREDIENTS: Cooked Pilau Rice, Water, Chicken Breast (14%), Onion, Red Onion, Tomato Paste, Green Pepper, Red Pepper, Rapeseed Oil, Yogurt (Milk), Ginger Purée, Cornflour, Garlic Purée, Spices, Brown Sugar, Salt, White Wine Vinegar, Tomato Purée, Coriander Leaf, Maize Flour, Cumin Seed, Fennel Seed, Kalonji Onion Seeds, Mustard Powder, Basil. Cooked Pilau Rice contains: Water, Basmati Rice, Rapeseed Oil, Cumin Seed, Turmeric Powder.